No, I’m not talking about the old TV show. I’m referring to the Giant Sequoias of California. First there was the drought, then all the rain. Feast or famine and climate change has a lot to do with it. My wife got back a few weeks ago from a trip to see these giants. Many of the biggest are failing due to all the rain of late causing them to become uprooted. Still it was worth the trip and I recommend you do it while they are still around. The following link is a bit of hopeful news that I thought I would pass along. I know I don’t post on this blog very often but it is hard to keep up while working a full time job and being involved in other activities. Maybe someday I will become a full time tree advocate and be able to blog, speak and educate full time. I can dream. You have experienced my rants before, but on Thursday I was shaken to my core. According to a new study in Nature magazine, at the current ratio of destruction/planting, the Earth will run out of trees in 300 years. Don’t let the headline fool you. Please read the whole article. This is something I have been concerned about for a while. One of the main reasons Tree Guardians is dedicated to the protection and maintenance of mature trees is because I know how important trees are. We let people too easily remove trees. Some towns have no ordinances at all when it comes to trees on private property. I know the Morton Arboretum is working on ordinance templates to distribute to the towns in the 7 counties of Chicagoland through the Chicago Region Tree Initiative. I know this because I am on the committee that has been working on this project. I still think this is not enough. This is voluntary and only one level deals with trees on private property. I know a lot of people hate government intervention but in my opinion trees are too valuable of a resource to leave to regular homeowners to decide their fate. We need to start treating trees as the irreplaceable they are instead of decorations that can be removed and replaced at a whim. 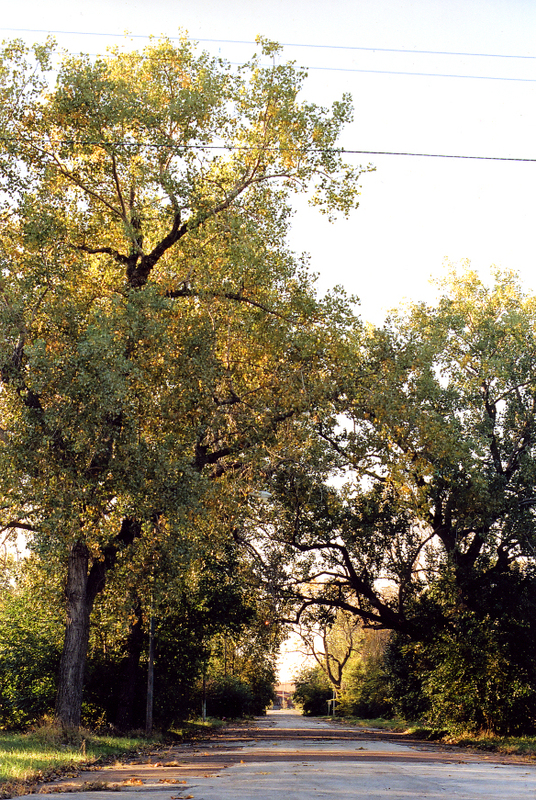 I have heard people who should know better, a well known lady who works for Illinois Department of Natural Resources (IDNR) say to a group of municipal arborist that IDNR was happy if they can achieve a one-to-one replacement of Ash trees. The Arbor Day Foundation tells people if they remove a tree to plant two more. THIS WILL NOT DO! We need to regulate who can work on trees and remove them. No more “anyone with a pickup truck and a chainsaw” doing work throughout Chicagoland. We need to train these people and make sure they are not just removing trees to make work and make a living. Some people talk about SAVE THE EARTH, SAVE THE PLANET. I have never bought into this BS. The planet will survive, we will not. As a tree hugger(really a tree kisser) people think I care more about trees than people. WRONG! The reason I care about trees is because I care about people. I know that the human race cannot survive without trees. Trees are alive! While this may seem obvious I point it out because sometimes they are treated like inanimate objects. Because they are alive they need care and nurturing throughout their lives. As with any living thing; like a child or a pet, provisions should be made for the care of that life as time goes by and it gets older. When you get a pet you know you will have to spend money on vet bills, food, toys and various other things. When you have a child you know you will have to provide clothing, food, shelter, payment for other activities and maybe a college fund. The same is true for a tree. The idea that you just plant a tree and let “nature” take care of it is a false one. For most landscapes, whether they be at single family houses, multifamily developments or commercial properties, they are not natural but composed of trees and other plants chosen by humans because of what they think would look good or ones they desire. Even if native plants are used, it is still an artificially created environment. We want every plant in our landscapes to thrive and be a specimen tree. If you visit a forest preserve or other natural area and look closely you will see not all of the plants are thriving. There is much competition and some don’t make it. When they are young, they need help getting established. This includes being planted in the proper location, proper planting, watering and mulching. As they grow, they need proper maintenance—fertilizing, insect and disease control and pruning. Ignoring or delaying proper care does not save money, in fact it costs money. Problems that could have been prevented by proper planting and after planting care now need intervention to keep the tree healthy and alive. Stressed plants are more likely to have disease and insect problems. 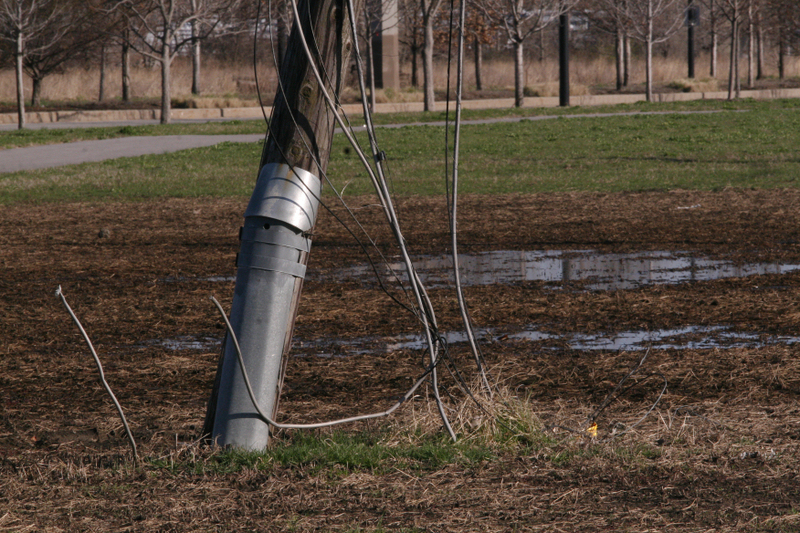 Trees that are not regularly pruned are more susceptible to storm damage. Leaving broken branches can be an ingress for disease and insects. Major deadwood can be a hazard and liability. As trees age to 10-20 years old, the benefits of taking care of them out way the cost of maintenance. Constantly replacing trees because they were not maintained means never having the benefits that mature trees bring. Trees are the only part of the infrastructure that do a better job as they get older and larger. 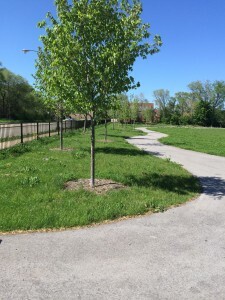 When you are replacing trees, even a 7-year old tree (the average age of a parkway tree in Chicago), you lose the time it took to grow that tree. Nobody has more time! So whether you manage a single home, a townhome complex or a commercial property. Don’t forget to plan for long term care of your trees. It’s worth it. Upon re-visiting Park No. 503 on May 18, 2015 there is good news. The park has a name. 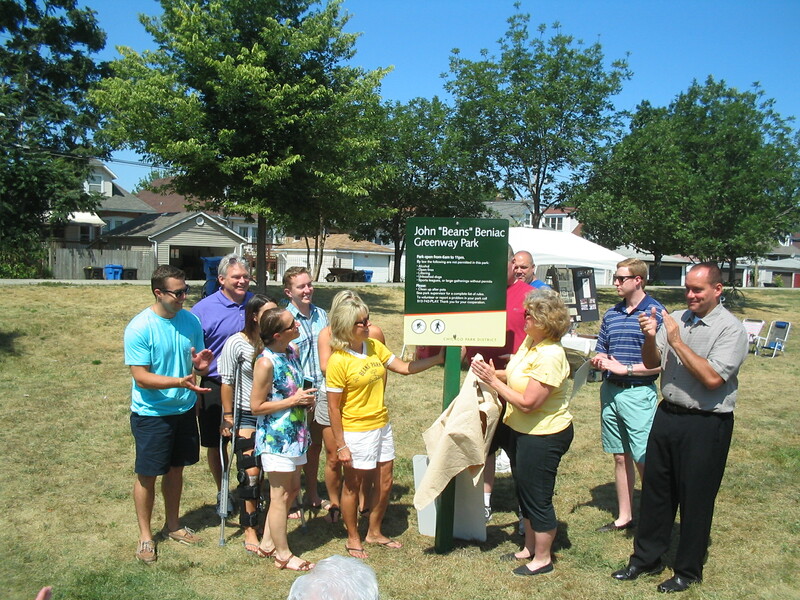 It is now known as Clara D. Schafer Park. 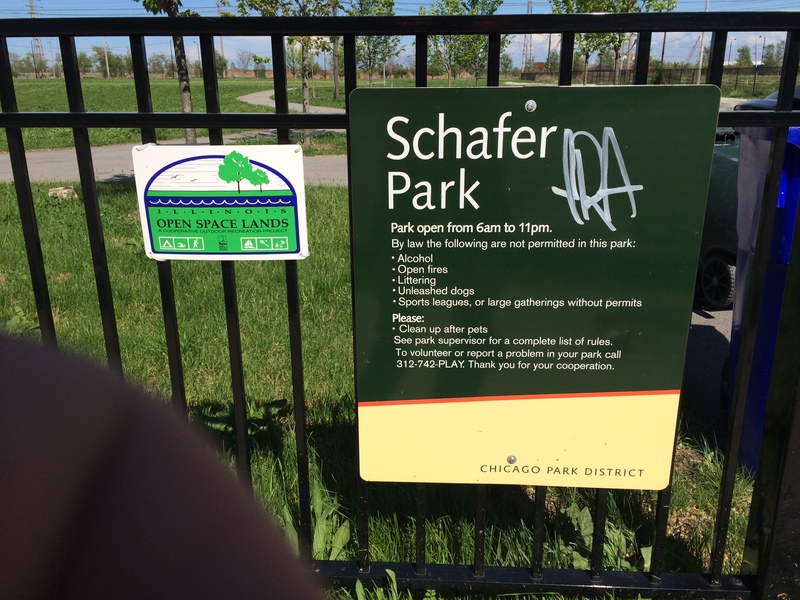 You can read Ms.Schafer’s story on the Chicago Park District website and you will probably agree that she is deserving of this honor. Looking at the park itself, you might wonder how much of an honor this is. Other than the name, Park No. 503 hasn’t really progressed much in 2 years. 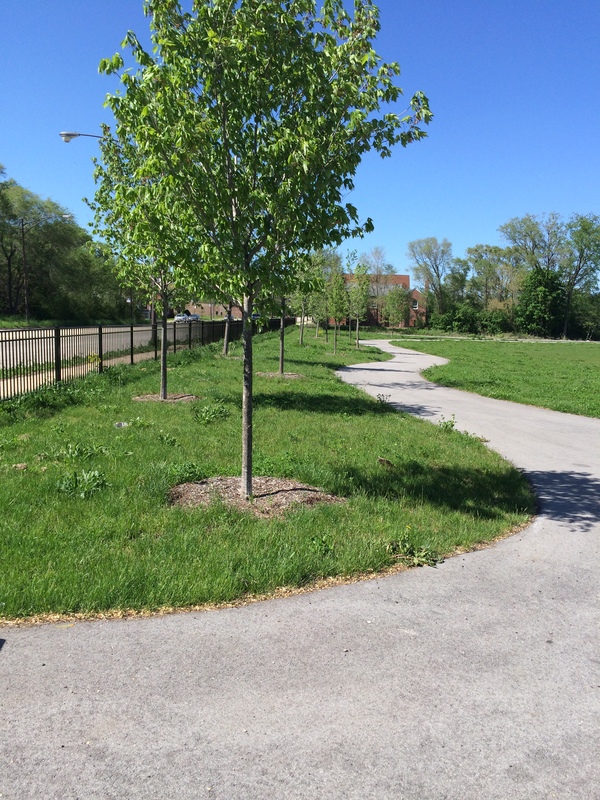 The Chicago Park District will want to talk about the trees that have been planted, but these 2” caliper trees in no way replace the 100-year-old trees that were cut down. There is also a bicycle/walking path that goes through the park. This would be considered the nicest view of the park. These trees might not survive except for watering being done by local residents. Because there are no amenities in the park, the path is basically a way to get to the other side. There are no benches, or shelters and most of all no restrooms, which is a main concern of local residents. 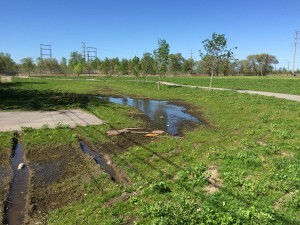 Another major concern is the lack of a fence between the park and the heavily traveled Route 41(also known as South Lake Shore Drive). Since there are no swings or other playground equipment why would anyone take their kids to the park to play? If they did it wouldn’t take much for a kid running after a stray ball to go into traffic and be hit by a car. What is interesting is that there is a fence on the west side of the park, the side on South Mackinaw Ave. Is this fence to keep the residents out of the park? Maybe we are looking at this all wrong. Let’s look at some of the other photos that were taken on May 18, 2015. 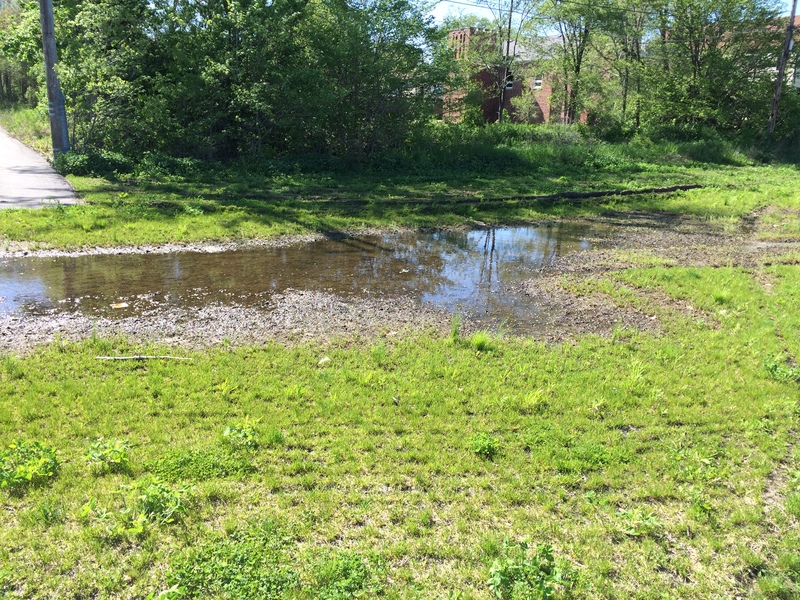 Maybe this is a wetland area in the making. Or maybe it is just some tire ruts. By now it is probably dried up. Is this the future home of the parking lot? No matter how you look at it Park No 503 is barely better than a vacant lot. It’s just a field with a lot of weeds. The citizens that live in the Park No 503 area deserve better. We understand that the trees will take many years to grow enough to provide shade. In the meantime, how about a shelter with a picnic table? A fence along Lake Shore Drive to protect the children from this high traffic road? Or at the very least, restroom facilities. Make Park No 503 a place that invites the public to visit and stay and have a good time. Create a pleasant destination that the residents are proud of and the descendants of Clara D. Schafer are too. 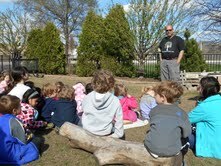 On April 25, 2014, Arbor Day in Illinois, I had the pleasure of talking to the pre-school and kindergarten kids at Elmhurst Academy, Elmhurst, Illinois. This is the 3rd year I have visited this school on Arbor Day. These children are especially smarty and already know a lot about trees and the environment. This is due to the great job being done by Kaitlyn Berger and the rest of the staff. 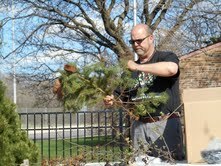 Here I am showing the kids one of the many branches that I brought in from different trees. They really enjoyed seeing the samples and hearing explanation of the difference between evergreen(conifer) and deciduous trees. I’m going back in fall to talk about why and how leaves turn colors and I plan to have a great demonstration of that. In celebration of the holidays I decided to give the gift of one of my Jake stories. Please share this as with as many children as you want but remember that I hold all copyrights, etc. Cover art by Kathi Quinn. One day in December my son Jake came inside at the end of the school day. He looked like he was deep in thought, trying to figure something out. “What’s wrong, Jake?” I asked. I knew that “Christmas trees” is what Jake called evergreens; but I didn’t know why he thought the other trees were dead. “The Sid juice trees?” said Jake. 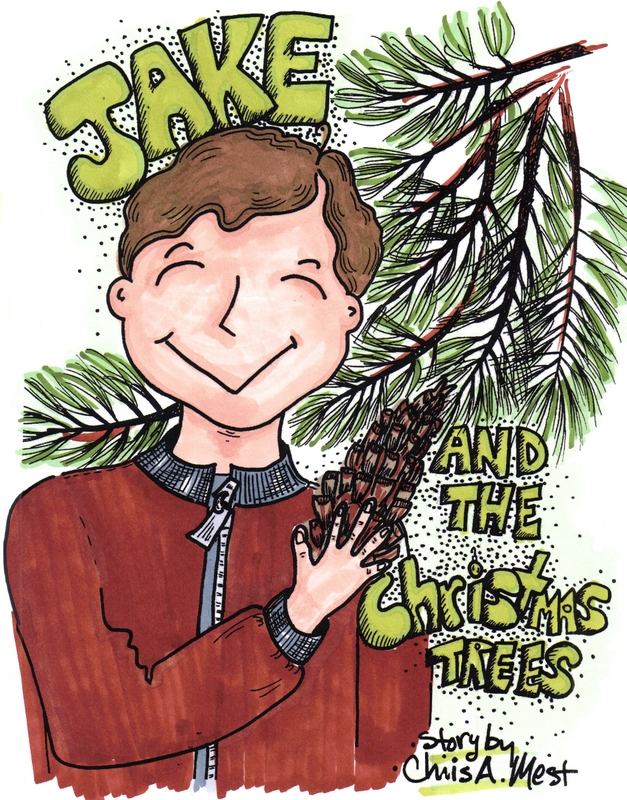 “What about the Christmas trees?” asked Jake. Jake was quiet for a few minutes. From the look on his face, I could tell he was thinking hard about something. They now have a new team—Urban Forestry. You might have guessed that I initiated this team and volunteered to be the leader. There are other Go Green groups in the Chicagoland area. They are made up of professionals, businessmen, parents and other citizens. The idea is to be a voice for decisions that are made about the most important issue humans have, a healthy environment. One thing we want to do is be watchdogs over the politicians and bureaucrats to make sure they are looking out for “We The People” and not just special interest groups whose only goal is to make lots of money. When it comes to commenting on the work of other companies in the “green industry” I try to be diplomatic. I like to support the other branches of the industry but when it comes down to it, I feel my responsibility as an arborist is to the trees (and bushes) and the people who spend money on them. Unfortunately, I spend a lot of my time looking at trees that are stressed or dying because they did not get a good start in life. What I am talking about is the proliferation of bad planting! I’d like to be able to say this was an isolated case but this is the norm rather than the exception. There is sufficient information available on the right way to plant trees so that is not the problem. What it boils down to is this—time is money and the less time you take to plant trees the more money you can make. In a word—-GREED! I advise my customers to educate themselves on the proper planting techniques. I have brochures I give them. I suggest they be home when the planting is being done so that they can make sure it is done correctly. They are the customer. We are talking about thousands of dollars’ worth of plant material. They have to be pro-active to ensure that their money is not wasted. The final word of advice I give homeowners is this—don’t be fooled by the one year guarantee that companies offer. Trees are designed by nature to last hundreds of years. One year in the life of a tree means very little. I can dig a hole in someone’s driveway, plant a tree and it will last one year in its own rootball! Don’t be impressed by this sales trick. There are other things to consider such as plant selection and placement. We have a saying, “the right plant in the right place”. Many problems can be avoided just by following this rule. Consult a certified arborist before making your choices. Do some research at arboretums and online. Even if you do everything right there is no guarantee the trees will live so it is best not to do anything wrong. Yesterday, August 17th, I attended the dedication of Park No. 499(not to be confused with 503) in the southeast side of Chicago in honor of John “Beans” Beniac. 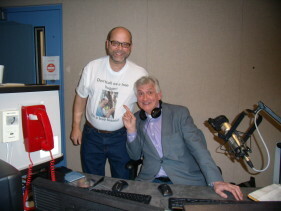 Mr. Beniac was a local resident of 10735 Avenue D.
Following open heart surgery, Beans started cleaning up the “prairie” across the street from his house as exercise and something to do. He started by picking up trash; 40 wheelbarrows of junk including tires and car batteries. Then he started mowing the area. The more he did, the more there was to do. His neighbor’s saw what he was doing and joined in. One started from the other end of the street and started mowing down the where Beans had stopped. Other residents contributed flowers, benches and hard work. Eventually, a bocce ball court was installed. This was back in the early 80’s. The area became the site for many July 4th and Labor Day parties. Legend has it that Beans would make his own “bombs” to explode on Independence Day but no evidence(wink-wink) exists to verify this. Beans died in 1994 but the park lived on. Local residents and volunteers continued to make improvements to the strip of land. John Pastirik, David Vance and Karen Roothaan just to name a few. A paved bicycle path now runs through the park and is heavily used. 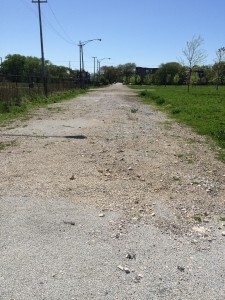 This is part of the Burnham Greenway, which is composed of two trails—Burnham Greenway North and Burnham Greenway South—that run along a former railroad corridor between Chicago and Lansing, Illinois. There are plans to extend and connect these short sections, which will create 11 miles of trail through some of this urban environment’s best natural areas. There was a good turnout for the dedication on another beautiful Chicago summer day. The Beniac family was well represented and Alderman John Pope was there as well as leadership from the Chicago Park District, Calumet Ecological Park Association and Southeast Environmental Task Force. John “Beans” Beniac Park is a great example of how one person lead and others followed. Throughout history there are many stories where an idea was acted upon and snowballed into a movement. Don’t be afraid do what you think is right even if you are only one person. If you do it they will follow. Last year I wrote a four page paper on the state of the tree industry. I called it “Speaking for Trees” but some people might have called it a manifesto. When I spoke to one of my arborist colleagues after he read it he remarked that I probably have more than one manifesto in me. Here is one of those manifestos. I want to take part of that paper and talk about the role of municipal arborists and who should be making decisions when it comes to public trees. This is not meant to be an indictment of any one person or group of people, just an examination of how things are done and a suggestion that they might be done differently. Care for the urban tree canopy falls to mainly two groups, municipal arborists and commercial arborists. Municipal arborists mainly deal with public trees, although many have a say in what happens to private trees. Municipal arborists have a tough job. They not only have to look out for the best interest of the trees but they have to deal with usually unhappy homeowners and politicians and worry about the trees as a liability. They are underfunded, under supported and are usually seen as the bad guy! Many municipalities are more concerned with parkway trees as liabilities instead of assets. They are quick to remove a tree instead of considering the possible remedies (cabling, rods, proper pruning). Some homeowners do take ownership of the trees on their parkway. They would be willing to pay the expense of maintaining them as opposed to having them removed. Why not loosen rules to allow a homeowner to pay for maintenance of a parkway tree? In one instance a homeowner got the okay to plant two trees on his parkway. Then, years later, one of the trees developed a crack in the trunk. He consulted a certified arborist who told him that by using cables in the canopy and rods through the trunk the tree could be kept alive. The homeowner then called the village arborist who’s first reaction when he saw the tree was that it had to be removed because it was a liability. Why not let the homeowner spend his money to keep the tree alive? In other metropolitan areas around the country, homeowners help foot the bill to maintain public trees. Why not here? 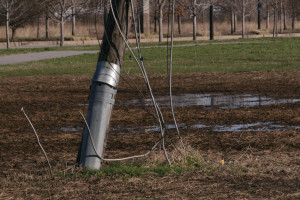 Another situation that municipal arborists deal with is that they are not allowed to make the decision on when and how money is spent on the public trees. An example of this is a suburb that is dealing with Emerald Ash borer. Four years ago, the village arborist came up with a plan on what to do pro-actively to protect the villages Ash trees. Unfortunately, the village mayor and council did not approve the allocation of funds to implement the plan. Then last year, with EAB being widespread throughout the village, funds were set aside to treat some of the trees and remove others. The trees that are being treated are in some cases 50% infested with EAB. While some of them might be saved, most will still die. The money being spent on these treatments at this point is basically wasted. Why not give the tree expert the money he needs when it will do the most good? Here again, maybe homeowners could help. Some municipalities have no restrictions on tree removal when it comes to private trees. Others that have ordinances are not strict enough. Even towns that have the strictest ordinances cannot replace the trees being removed. A town might have an ordinance that says if you cut down a 20 inch tree you have to plant 20 inches of caliper. In other words, 10 x 2 inch trees. While this does equal the same caliper inches it does not equal the same canopy size. Scientists have determined that the canopy of those 10, 2 inch trees only replaces 10% of the canopy of the 20 inch tree! Eventually, when those 2 inch trees grow to be 20 inch trees (if they do), we will have an increase in tree canopy. But that takes time, another resource we can’t replace! The time it took for that original 20 inch tree to grow. This is one of the reasons we at Tree Guardians feel it is so important to maintain and protect our mature trees. We can hear the reaction to our idea about protecting mature trees, “Tree Guardians, we cannot afford to maintain and protect our mature trees. We need to encourage ‘economic development’ and allow our trees to be cut down”. Poppycock! Trees are one of the few investments you can make in your towns infrastructure that increase in value over time. Unlike roads, bridges, buildings and other man made things that deteriorate over time and have to be repaired or replaced, trees get better at what they do as they age and grow. They get better at cleaning the air, cooling buildings in summer, mitigating storm water, furnishing habitat, etc. A great piece of research that points this out is “The Large Tree Argument” from 2003. It not only shows that we should be planting large trees, as opposed to the current trend of planting small, ornamental trees. This study also says that one of the worse things a town can do in times of a bad economy is to reduce or cut altogether their tree funding and staff. This hurts them in the long run. So we at Tree Guardians say, let the politicians decide how much money is to be allotted to take care of their trees, but let the tree experts decide when and how it is to be spent. It’s a nice sunny Sunday. You decide to take your family out to the local park for a picnic and some outdoor fun. Living in Chicago, one of the greenest cities in the world, there is a park a couple blocks away. So you pack up the wife and kids and put everything in your car. You drive down to the new park you heard about— Park No. 503. It sounds like this is an exciting area to live in and the new park should be something to behold. Looks pretty nice huh? 100 mature and healthy trees, some huge Cottonwoods, possibly 100 years old. “There were two mountain piles of wood chips from the smaller branches. The large tree logs were loaded onto large flatbed trucks and I guess were sold for profit.” said Vance. 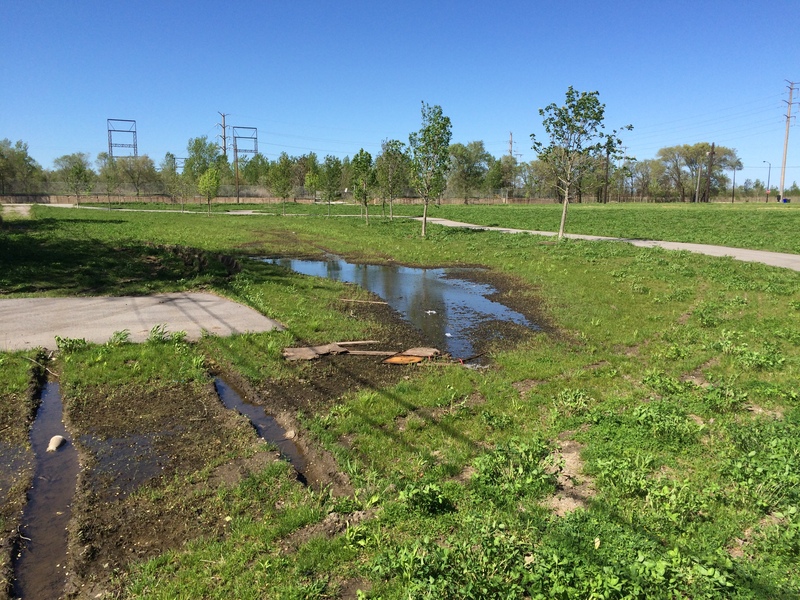 Dave Vance and other local residents want the park district to move forward with their plan to turn these now vacant lots into a park the taxpayers can use. They would also like to see more thought put into removal of mature, healthy trees. Evidently, the park planners like to start a park with a “clean slate”. If this is true, it shows a lack of understanding of the value of mature trees and an attitude that wastes valuable resources. Even if other trees had been planted immediately, the time it took to grow those mature trees cannot be replaced. 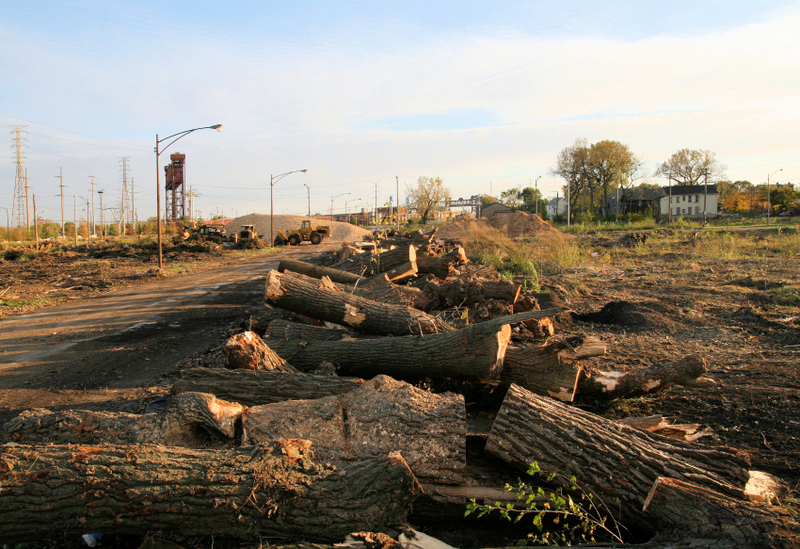 Tree Guardians has become involved with some of the residents of South Chicago to use our expertise in seeing that future tree planting and tree maintenance is successful. 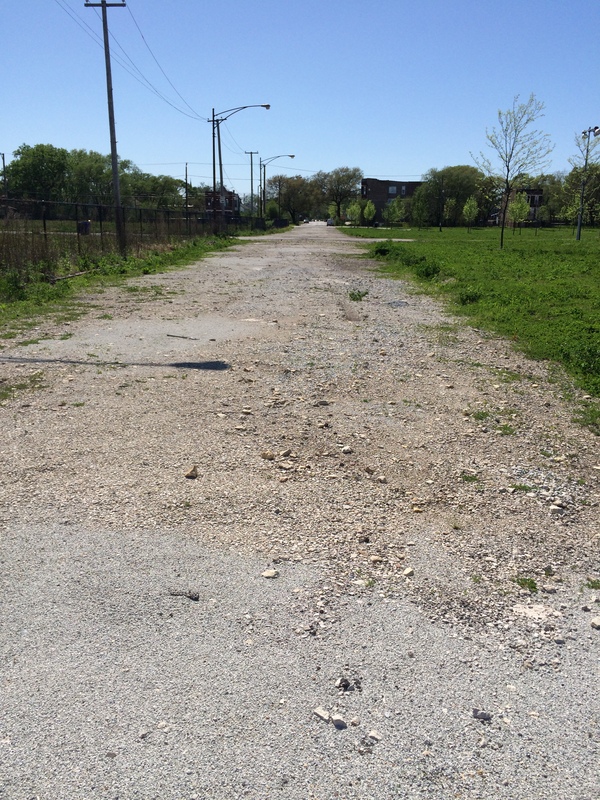 Local residents and politicians need to get involved to see that something like the travesty of Park No. 503 doesn’t happen again. Until then, the designation of Park No. 503 has an ironic twist. There is NO PARK 503! I recently discovered (kind of like Columbus discovering America, it was already there) the southeastern most part of Chicago. 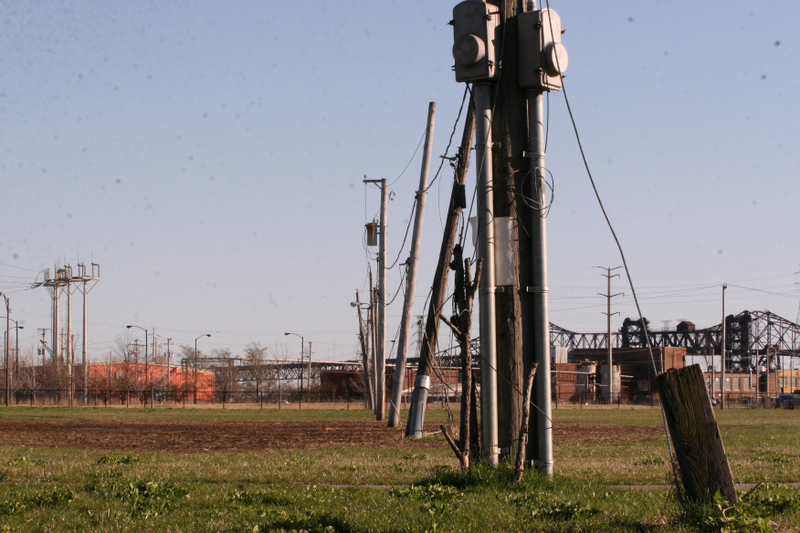 Part of which is called Hegewisch. This is an area that was built up around the steel industry. People moved there to be close to the jobs. Unfortunately, when the steel companies abandoned the area, the jobs disappeared and the area is now “economically challenged”. 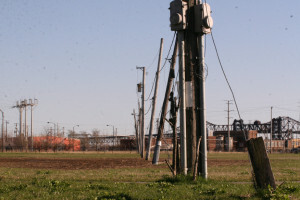 Where the old steel mills used to be is a lot of land that has been allowed to go fallow. It is my understanding that the city of Chicago controls this land. I believe the city should turn this land into a community garden, tree nursery and anything else that would benefit the local citizens. If the city controls it there should be a way to allow citizens to use the grounds to grow food and trees to use, barter and sell. Plots could be distributed on a need basis. In other words, the unemployed and underemployed would have first dibs. Maybe grants could be obtained through the Millennium Project or other sources to buy seeds, seedlings, biofertilizer, tools etc. Different beautification organizations could grow trees to use on their projects. Low cost trees could be available to local residents. This was supposed to be taking place upon old US Steel property, near 89th & Ewing by an outfit called Growing Power (http://www.growingpower.org/) but evidently that project had some problems. 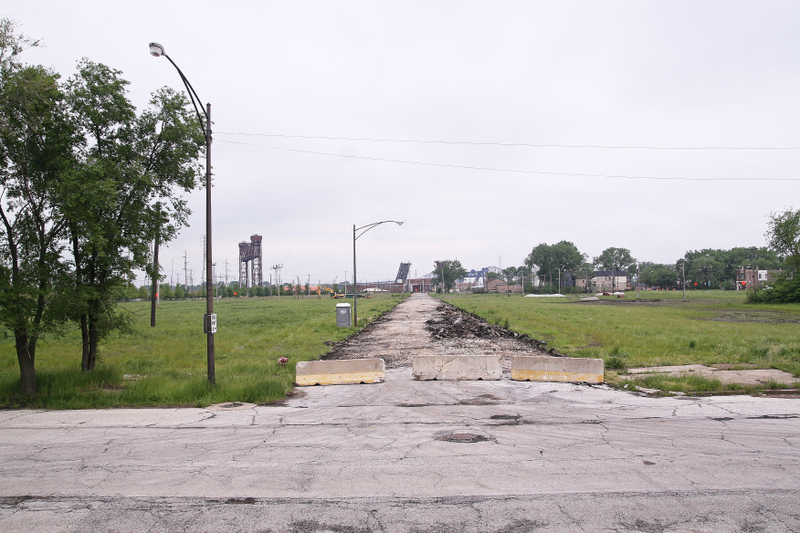 Throughout the Chicagoland area, Illinois and the whole country there are probably lots of plots of land that have gone unused. Let’s put these places to use to benefit people that could use them to help themselves have a better life no matter who owns the land. The benefits listed on this sign help all the people, not a select few who make money from cutting the trees down and “developing” the land. One thing about the sign I would change—we need to save ourselves, not Mother Earth. The planet would survive very well without us! This photo was taken at the Art Museum located at Forest Park, St. Louis, Mo. 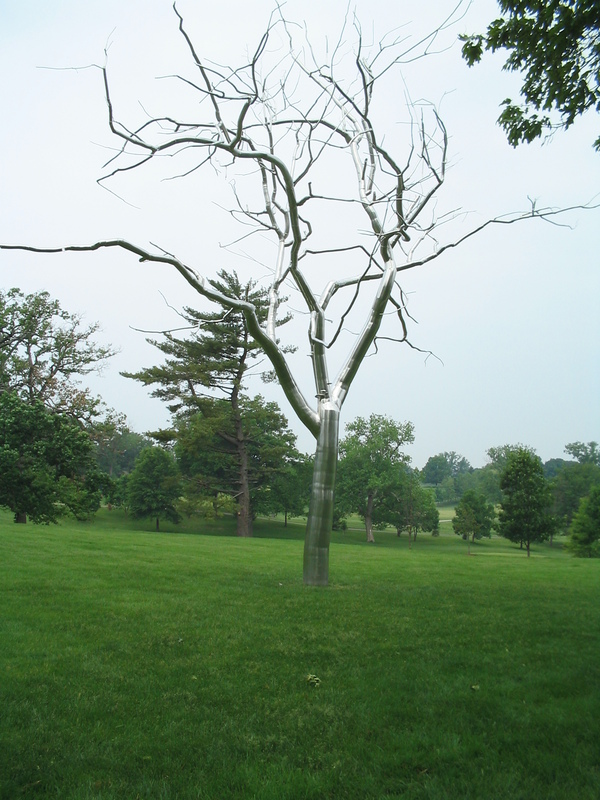 It is an artist’s idea of a tree. While it is beautiful in it’s own right it pales in comparison to a real tree, like the ones in the background. There is a guy who has invented an artificial tree. Klaus Lackner, Ewing-Worzel Professor of Geophysics in the Department of Earth and Environmental Engineering at Columbia University has already built a model. He has spoken to U.S. Energy Secretary Steven Chu in May of 2009 to explain the concept and he has submitted a proposal to the U.S. Department of Energy. This technology is not meant to replace carbon capture and storage methods being tested for use on coal-fired power stations. It’s targeting carbon already in the air. “Half of your emissions come from small, distributed sources where collection at the site is either impossible or impractical,” said Professor Lackner, “We aim for applications like gasoline in cars or jet fuel in airplanes. We are going after CO2 that otherwise is nearly impossible to collect. The magnitude of the task of reducing global carbon emissions is daunting. One day urgent action will need to be taken—when the planet is too warm, ice is melting too fast. In that case, we will need to have a way of pulling the CO2 out of the atmosphere. The point I am trying to make is that this guy has come up with something that does the same thing as a tree. Granted, it does it better but this is only needed because of the harm humans have done to the atmosphere. It also only has ONE of the benefits a tree does. Trees do many more things than the artificial tree. If imitation is the sincerest form of flattery than trees should feel very flattered, they can be imitated but not improved on. We need trees now more then ever. REAL, HEALTHY, MATURE ONES! This is where my rants will appear. I will have a lot to say and maybe even have guest bloggers. Please check back. my followers! Wonderful blog and brilliant styyle aand design. site, I would love to have the theme that you are using so I can put it on my page (soundcloud downloader). I don’t know how my blog would have turned up on Yahoo but to answer your question the “theme” is based on my new logo that was designed by my wife. to your garden (and usually your house) so you really should give consideration to your options for this. You make a good point. As someone who works everyday in the tree care industry I can tell you there are reasons people choose not to have the stumps ground. Sometimes it is just to save the additional cost. Some people use the stump to put potted plants on top for outside display. Sometimes the stump is not accessible to the grinder. We leave it up to the customer whether or not they have a stump ground when a tree is removed. I know that this blog is dedicated to keeping mature trees….I still thought you should know about a group of local scouts who have been planting trees and maintaining them for the past several years. The scouts of Pack 773 on the East Side of Chicago have been planting trees at Wolf Lake at the Living Memorial Site. Some of the trees the boys have planted have been cut down by the workers cutting the lawn (even though they have been clearly marked) but the scouts go right back and plant another tree. The scouts have earned patches for their efforts, merit badges (forester) and can return each year to take their picture with their tree and watch as it grows along with them. These boys are the next set of tree guardians! I am happy to find out about anyone or group who cares about trees and the environment. I would like to hear that the scouts are learning about the importance of mature trees and how the larger a tree gets the more benefits it provides. There are a lot of group that are devoted to planting trees and that’s a good thing. I started Tree Guardians because the importance of protecting and maintaining mature trees is largely ignored. Too many people think that if a tree is cut down it can be replaced by planting another tree. This is just not so! The time it takes to grow a tree to be 20 years old, 50 years old or 100 years old cannot be replaced. None of us have more time. Please teach the boys that! This is so disgraceful. How could anyone with one ounce of brains do something as hateful, criminal, shameful, and disrespectful of not only the community, city, state, and the planet, but to all of the many different species of plants and animals that have returned, but are now gone again. Are we turning totally stupid ??? All this “Park” needed was some pruning, and some cleanup and it would have been the beginning of a beautiful experience. Instead, it turned into urban blight, an eyesore, and an insult to mankind. Shame on the government of City of Chicago, its Parks Department, and the lazy people who could not and would not care. So let’s start all over again from the beginning and wait another 100 years for everything to mature, then watch another lunatic come around and cut it all down again. Isn’t that what we do best??? Thanks for reading this blog post and commenting. Unfortunately, this attitude is not unique to the Chicago Park District. Homeowners, town councils and developers in many places too easily allow and encourage the removal of healthy, mature trees. I have also found through my Facebook page that this is a common occurrence around the world. Places like Australia and the Philippines have advocates who are fighting their own government to keep them from unnecessarily removing mature trees. Those of us who care and are knowledgeable as to the benefits and importance of a healthy urban canopy need to be active in educating the rest of the World. Healthy trees and healthy humans are tied together. This is an issue that can’t be ignored. Thank you Chris for bringing attention to the horrible situation at Park 503 at the lakefront on Chicago’s south side. What the Park District has done there is appalling -it should be criminal- yet it doesn’t surprise me in the least. There is a need for environmental groups, tree advocates, and anyone with an appreciation for nature and our planet to come together to press for sensible ordinances and legislation for the protection of our green canopy. Clear-cutting of wonderful groves of mature trees should be no less regulated than animal abuse or other crimes against nature are.